FACT CHECK: Can a Crayon Be Used as a Candle? 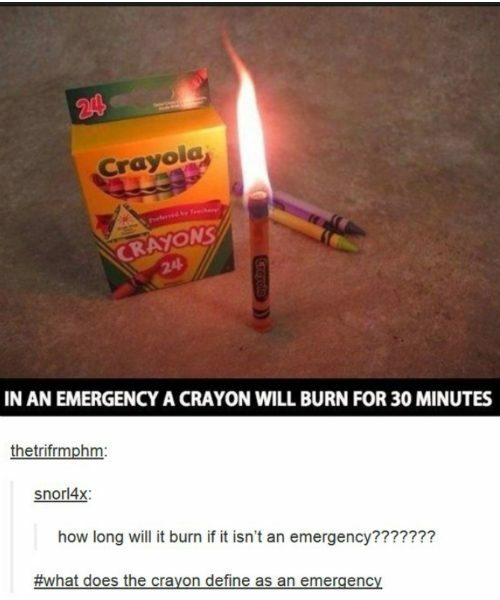 A children's coloring crayon can be used as a candle in an emergency, for maybe 15 minutes or so. 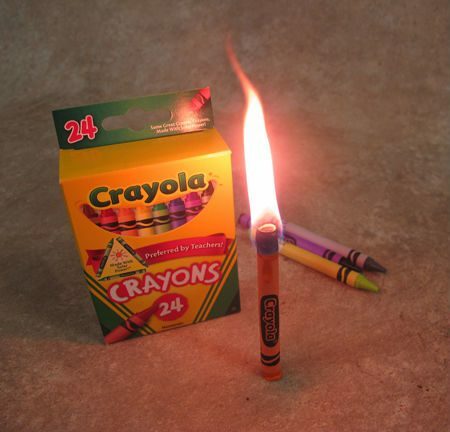 A coloring crayon can be used as a candle for a short time in an emergency. Crayons are basically colored wax. If youre in a hurry, just break the point off and light the paper label at the end of the crayon. As the wax melts, the paper becomes a wick and one crayndle will last about 30 minutes. Not too bad. The image of the “crayandle” pictured above has been circulating since at least 2013, when it was posted by Willow Haven Outdoor in an article titled “5 Make-Shift Urban Survival Lights When the Electricity Goes Down.” The list also included other flammable, light-producing items such as sardine oil and bacon fat, but it was the Crayola candle that truly caught the Internet’s attention. The picture is frequently shared on sites such as Pinterest, and several bloggers have conducted their own Crayola candle experiments. Crayola Crayons are made primarily from paraffin wax and color pigment. We do not recommend that Crayola Crayons be used to produce candles. 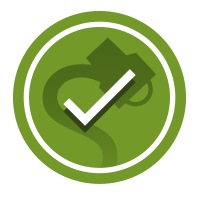 They have not been tested or approved for this type of use.